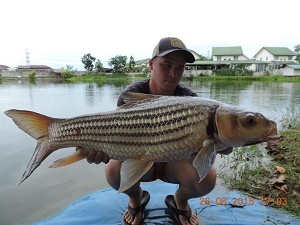 Martin from Belgium continued his Thailand fishing holiday with a visit to Palm Tree Lagoon in Ratchaburi. On arrival at the lake the angler began fishing two rods for carp and one predator outfit. It wasn’t long before the angler was soon into a Redtail Catfish which powered off across the lake towards the far end of the lake. After a ten minute battle the Redtail Catfish was finally brought to the net and estimated to weigh around 30kg. Another Redtail Catfish soon followed before the predator rod fell quiet. After a quiet spell on the carp rod the angler soon found himself bent into an unseen carp after a brief battle in the nearby margins a stunning Julien’s Golden Prize Carp was brought to the bank. 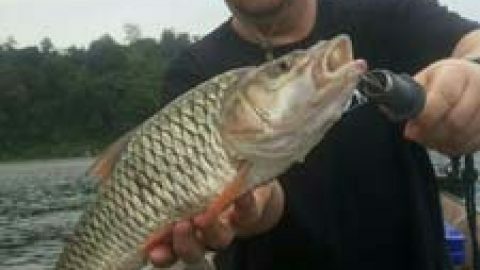 The carp was estimated to weigh 8kg’s and quickly returned to the lake. Martin also caught a Black Shark Minnow carp later in the afternoon and also added a few more catfish before the days Thailand carp fishing Palm Tree Lagoon ended. Fishing in Thailand at Palm Tree Lagoon.